If you’re an active participant in the Sketch beta this little Hazel rule might be for you. When using the (beta) app it pops up a “new version available” dialog at the start of every workday. Of course this is getting cumbersome after 20 or so days. 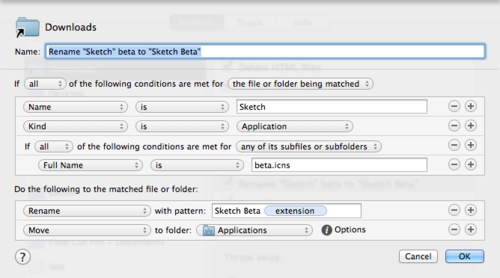 You have to go to their website, download, rename to “Sketch Beta”1 and move to Applications. The trick is easy. The beta app contains a file named “beta.icns”. If this is present, then the app should be moved and renamed.